I started planting some seeds yesterday. San Marzano tomatoes, basil, bibb lettuce, chard, kale and radishes, to be exact. Last year, though my intentions were good, I had to buy starter plants for every single thing we grew. The reason, you ask? Our beautiful, obnoxious, and far too curious black lab decided to tear up my seed trays last spring. Twice. So I eventually gave up and decided seeds were not in the cards for us just yet. I planted 28 tomato plants. No, I don't know where they will all go just yet. I think I'll cross that bridge when I come to it since there's no guarantee all the seeds will become actual plants. Some will go to better homes but I hope to have several to keep to myself so I can make lots of sauce and can it. I'm not going to get too excited just yet. While I don't think my thumb is black, it is not bright green. Gardening does not come easily to me and I've had quite a few mishaps. Baby steps, right? Not only is it the season for gardening, we are heading into prime brunch season. Mimosas, Bloody Marys, various cheesy, hot sauce speckled, buttery egg dishes, bacon, and cinnamon rolls galore. Oh...healthy things too. None are coming to mind though. 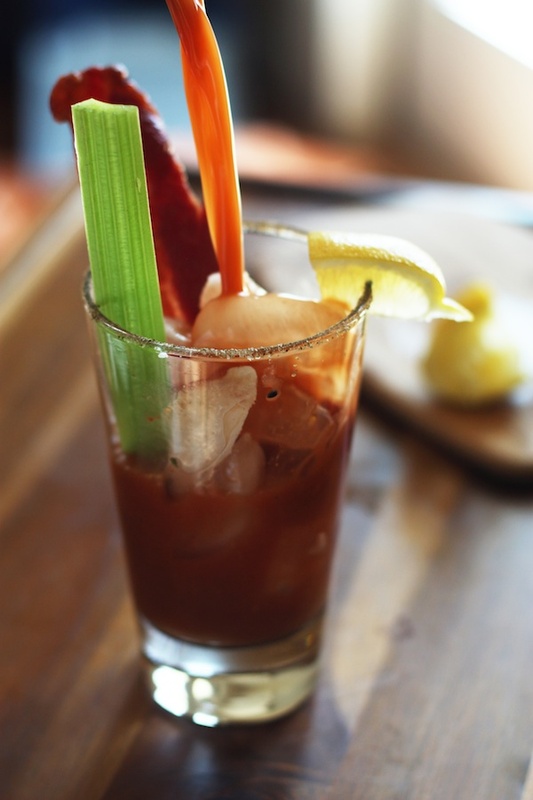 I first made a version of these Japanese Bloody Marys in 2009. We were in Tokyo, Japan and had survived our first 6 months living a world away from all the things we knew and all the people we loved. Fortunately, we had quickly developed a Tokyo 'family' with whom we celebrated Easter. We spent the day on the banks of the Tamagawa, a river not far from the school where we all taught. We grilled, drank, laughed, and got minor sunburns. It was a fantastic day. 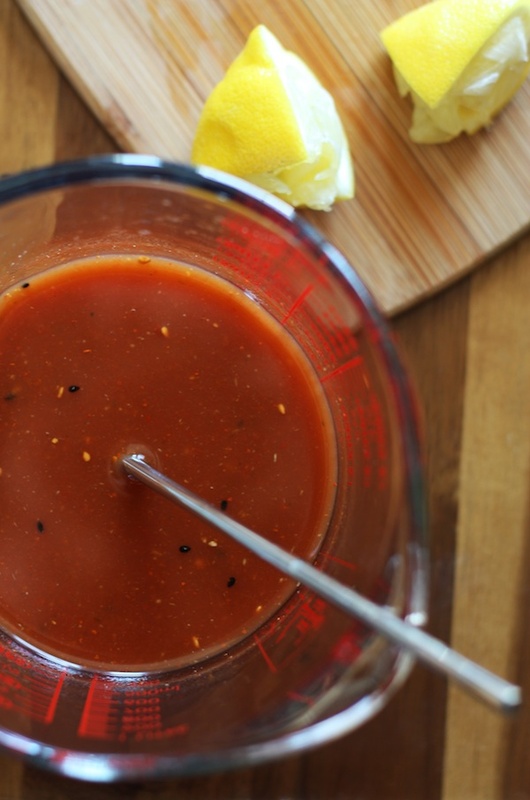 I've taken the recipe I used that day and fixed it up a bit. 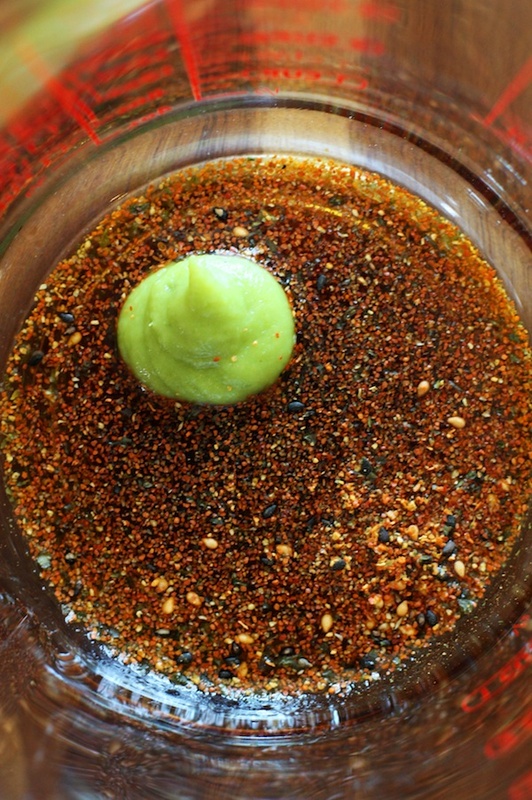 I added spicy shichimi togarashi, a blend of red pepper flakes commonly used in Japan, along with some wasabi for a horseradish-like bite, and salty-sweet soy sauce in place of worcestershire sauce. 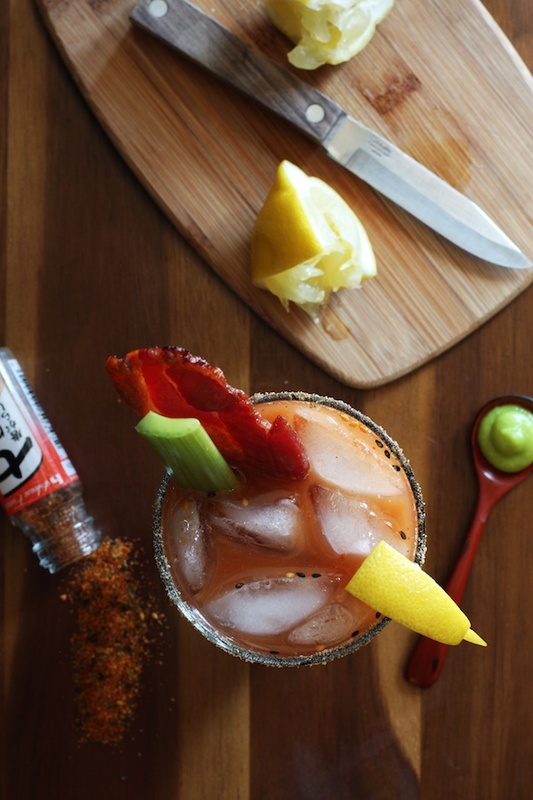 The result is a perfectly balanced Bloody Mary that has hints of its classic counterpart but adds a nice change to the world of Bloody Mary creations. Cheers to Friday and brunch and gardening and Spring! Put 1 1/2 oz of vodka in each ice-filled glass. 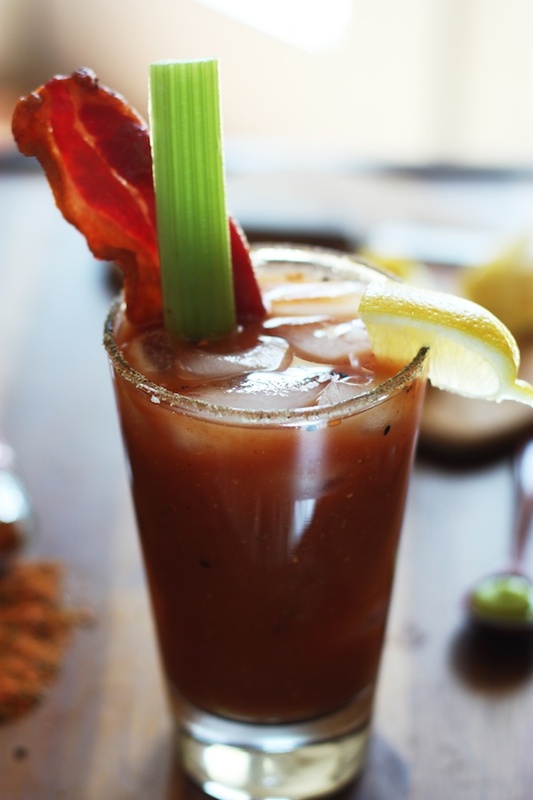 Top with the tomato juice mixture and garnish with celery, bacon and lemon.